The freezer section in your grocery store can be the ultimate diet disaster. Filled with ice cream, deep dish pizzas, tater tots and french toast, heading to the freezer section when you’re hungry is a risky venture. But thanks to our friends at Women’s Health magazine and ABCNews.com, they scoured our supermarket freezers for the best picks in frozen foods for women. They broke the list down into categories: pizzas, dinners, side dishes, ice cream and more. Here are their picks that I agreed with and a few more that I thought should have made the cut. 1) Skinny Cow Ice Cream Cones: The diet experts at ABC got this one right. 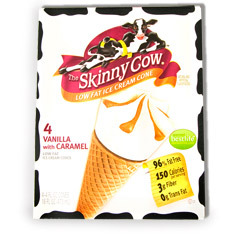 Skinny Cow ice cream makers have hit the mark on making creamy delicious frozen treats with a fraction of the calories and fat as their full-fat counterparts. Their vanilla cone with caramel ribbons is divine for your lips and hips. One cone comes in at 150 calories and just 4 grams of fat. 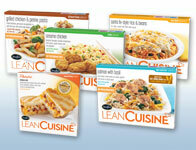 2) Lean Cuisine’s Spa Dishes. Their Four Cheese Pizza and Chicken in Peanut Sauce got high ranks for flavor, quantity and nutritional statistics. Amy’s veggie bowls also received rave reviews from vegetarians or meat-lovers who opt for a meatless meal. 3) Alexia Sweet Potato Julienne Fries were rated best frozen french fries. Twelve hearty fries have 150 calories and tons of cancer-fighting Vitamin A. 4) Van’s Hearty Oats Berry Boost Waffles sport just 100 calories per waffle and also contain bone-strengthening calcium, satiating fiber and heart-healthy omega-3 fats. Now that’s a healthy way to start your day! 5) GardenBurger’s Portabella Burger won the #1 spot for best veggie burger. Hearty portabella mushrooms and creamy mozzarella cheese make this low-fat and low-cal option an awesome way to quell a burger fix! Boca’s All-American burger got first billing for best soy burger with its heart-healthy soy protein and fiber. For best frozen egg rolls, Kahiki egg rolls get my #1 vote. MorningStar Farms Garden Veggie Patties and their veggie sausage patties are scrumptious. And while I love Edy’s Slow-Churned Light ice creams, Breyer’s Double Churn Fat Free is the BEST fat-free ice cream I’ve ever tasted. Sorry, but in my experience you will never lose weight eating imitation foods like this. Oops, I didn’t mean you wouldn’t lose weight. You just won’t keep it off. You can lose weight eating just about anything so long as you don’t eat very much of it. Darya, I couldn’t agree with you more! Moderation is paramount whether you are trying to lose weight or just stay healthy. Studies show that deprivation diets may work in the short-term but for long-term sustained weight loss the best recipe for success is eating the foods you love like a Skinny Cow ice cream cone or a slice of cheesy pizza, every now and then. And enjoying them completely when you do indulge!